If you&apos;ve been on La Brea in the Miracle Mile area since Sunday, you may have noticed an unusually large communist leader&apos;s head appear at the southeast corner at 4th Street. 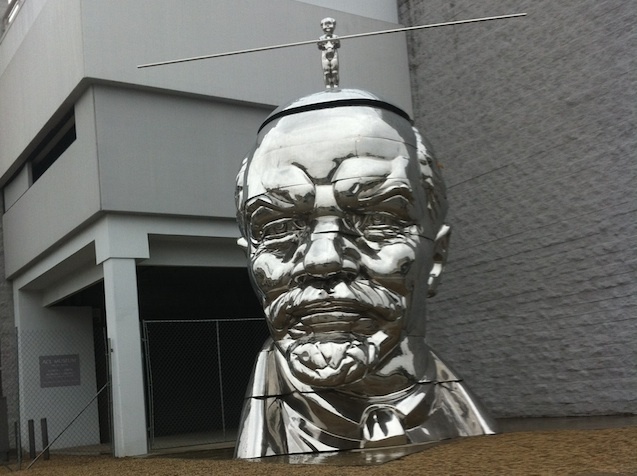 This is the Ace Museum, and that head belongs to Lenin—in art form, at least. The Lenin sculpture, called "Miss Mao Trying to Poise Herself at the Top of Lenin’s Head," went up overnight Saturday, and is a work by the Gao Brothers, Gao Zhen and Gao Qiang, of China. It&apos;s part of an ongoing series of works that includes the "Headless Mao." The work was displayed in January 2010 in Vancouver, Canada, where it stirred up controversy. The artists have included several elements that show this controversial figure in a new light for the world of art. With a vivid chrome finish, the metal sculpture is constructed from horizontal sections that were purposefully staggered to make up this very thought provoking likeness of ruthless Russian dictator Vladimir Lenin. As such a well know person, the artists’ decision to give his face a chrome finish takes the focus away from Lenin, and to the sculpture’s context by allowing the reflections to highlight the immediate surroundings instead of Lenin in an appropriately demeaning fashion. The staggered sections represent his broken and destructive legacy that brought so much turmoil to Russia. Atop is a very playful inclusion of baby holding a balance stick on top of Lenin’s protruding head, as if walking a tight rope of his disastrous and risky Marxist ideals.